Hmm.. I was more stoked we had chocolate digestives in the cupboard than this VOD. its a nice vid but it's getting old always seeing it on the front page for a couple days first. i'm starting to expect something i've already watched everytime i click vod anymore. I haven't seen a VOD that I haven't already seen on the front page for weeks now. And tbh, with this one, yawn other than the very end. This is an advert - not VOD. That's exactly why it is vod unfortunately. To be fair, almost every article and vod on here is an ad. I mean that whole Vanderham thing was just a Saint ad. If it's good it doesn't really matter, but it's really annoying not seeing anything that hasnt been on the front page already. Wow tough crowd around here for a 100% free website with the best cycling content in the world. We should start riding no name bicycles in plain white T's listening to dubstep while dirt jumping. I love this video, sick angles and great riding. Maybe people who don't ride AM just don't appreciate riding that isn't flat out charging all the time? Yeah, it was made for MEC but every kid on this site who's parents finance their riding is going to realize pretty soon that to ride and film you need money. It's as simple as that. I thought that for an ad this was very tasteful and riding oriented, so I really have no issue with it whatsoever. Love the mix of all mountain mixed with some big moves! You guys kill it so hard! What was the song again? c'mon its one of the only things in the description! I dont understand what all the hate is for? That was such a sweet video! Imo VOD should be a place for exceptionally good videos that would otherwise get lost in the mass of edits in PB, not for videos that have already been seen by everyone on the frontpage etc. Maybe it's simply too much asked... Cool AM edit nonetheless with refreshingly tasty music! I thought it was an absolutely sick piece of filming and loved the riding in it. Wow there are some haters on here. It was a good video. Props for hitting that drop on a trail bike. Looks like some fun trails. I think this is a good Vod, has a sick trail, sick bikes, sick features. True i hate seeing videos that i have seen on the front page before but its still a sick video. Nice trails and well shot but too slow paced for a VOD. well, if the cagua was only available for purchase here in calgary, i would've agreed this is VOD. but that's not the case. so MEC if you're listening, BRING THE CAGUAS to calgary! this is good ol mountain biking, punks! I Love the video. A great intro for those bikes. Looks like a cross between trek and ellsworth. Demoing one might not be a bad idea..
Fun ride no doubt, boring video though. Nice drop at the end on an XC bike . How does a video become a VOD then? Who decides?? that bike had 4 more inches of travel than the girl needed. 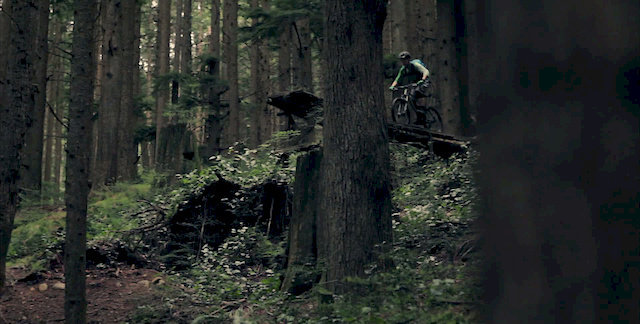 fantastic editing, fantastic shots, fantastically weak riding. Disgraceful, pinkbike used to be a great independent site and although I understand the necessity of having a good income stream selling yourself out to bike companies and not rewarding real talented videos is something that for me goes against the values of the sight. Also I don't get why that bothers kids like you so much? Who cares what company is making the video just as long as there's illy ripping in it and it's made well.